The National Liberation Movement of Azawad (MNLA) consists of an alliance of peoples from the Sahel and Sahara regions—Tuareg, Songhai, Fula, and Arabs—who collectively demand two-thirds of the northern part of Mali to become their independent, multiethnic and multireligious state of Azawad. The history of the Azawadian revolutionary movement lies in the resistance against the French-Sudanese colony and the foundation of the French-backed state of Mali in 1960. To date, four armed rebellions have taken place since the establishment of the Malian state, the last one being in 2012. 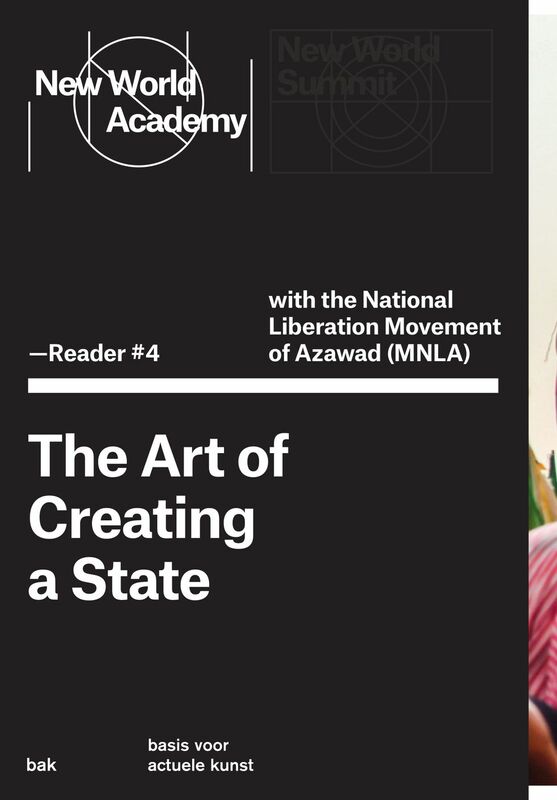 For the Azawadian movement, the creation of art and laying the foundations of a new state are part of the same project. With contributions by: Abdallah Ag Alhousseini (musician, Tinariwen, Azawad); Moussa Ag Assarid(artist and diplomat, MNLA, Azawad and France); Banning Eyre (musician and writer, United States); Sennhauser Keltoum Maïga (artist and poet, Azawad and France); Berny Sèbe (historian, United Kingdom); Tinariwen (musicians, Azawad); Mazou Ibrahim Touré (artist, Azawad).